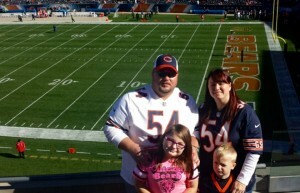 While my dad was busy making Warrior Wishes come true in Atlanta, I had the opportunity to meet up with a Gold Star family in Chicago and made their Warrior Wish come true at the Chicago Bears game in honor of Army SPC John “JD” Amos II. SPC John D Amos II enlisted in the army in 2002. He decided to join the Army after Sept. 11 2001. John’s mom signed the needed paperwork so he could take his test early. After he finishes his basic training at Ft Benning in Georgia he tried to become an Army Ranger, but missed it by one push up. He left Ft Benning and went to Schofield Barracks, Hawaii. He was with the 1st Battalion, 21 Infantry Regiment, 25th Infantry Division ( light). In January of 2004 John was deployed to Iraq. SPC Amos was on patrol in Kirkuk on April 4th, 2004. He was in the front of his unit and opened fire on a vehicle that was driving towards them with no intention of stopping. SPC Amos made the ultimate sacrifice while doing everything he could to protect his unit. Family members were told that told his actions saved 60+ lives as he didn’t hesitate to open fire on vehicle coming towards them. If he had waited even 4-6 seconds most of his unit would have been killed or wounded. Army SPC John “JD” Amos received the Bronze star, Purple heart and the newly made Hawaii Medal of honor as he was the first combat casualty from Hawaii, he was just 20 years old. Family & friends remember JD as always being funny and goofy he always cared about his family and loved being in the Army. It’s an honor to share his legacy and host surviving family members at the Chicago Bears game in his honor! Please join us in thanking the Amos family for their service and sacrifices. Game 19 – Warrior Wishes Come True In Atlanta!